The Grand America’s VIP Amenities are a gracious, thoughtful way to let someone special know you appreciate them. Give your special guest the VIP treatment with beautiful handmade artisan chocolates or a personalized gift basket. For a romantic occasion, let us prepare a rose petal turndown. And what better way to say ‘Sleep tight’ with love than with a bedtime snack of milk and homemade cookies? Prices reflect a 20% service charge, $3.50 delivery charge ($5 floral delivery charge), & Utah State Tax. To arrange VIP Amenities, please contact our Grand Ambassadors at ambassador@grandamerica.com or (801) 201-5691. From a single perfect rose or an abundance of brilliant blooms, The Grand America’s in-house floral department will help you create an inspiring and memorable occasion. We are happy to deliver to your room or the room of your special guest. *Prices do not include taxes or a $5 delivery charge to place the flowers in the guestroom prior to your arrival. 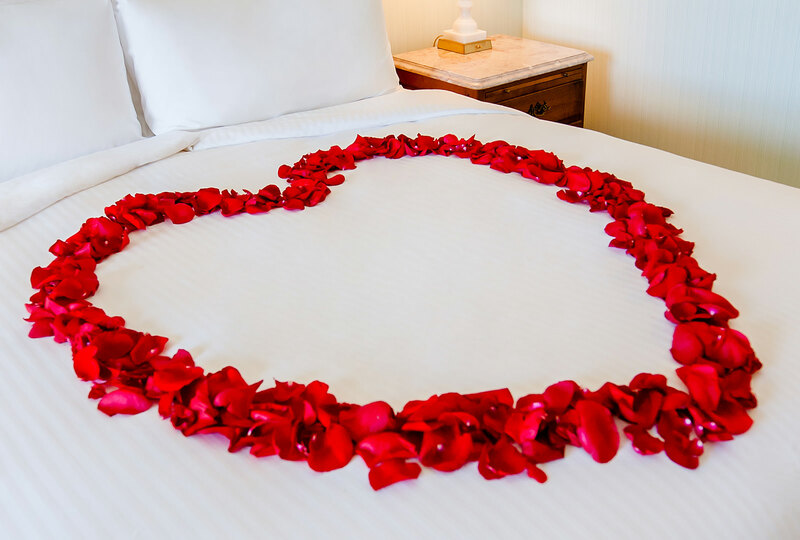 A romantic and tastefully seductive bed of rose petals awaits your arrival. Choose a diffusion of rose petals or a heart shaped design. This delightfully decadent treat includes a combination of Belgian white & dark chocolate. Signature 6-piece presentation. We offer a wide selection of vintage and non-vintage sparkling wines and champagnes. Our list covers well-known champagnes from France to popular sparkling wines from California. Specialty French-inspired delicacies: Signature 5–piece French Macarons. Choose from a wide selection of vintages, varietals and regions. Our prestigious list includes wines from across the globe. We endeavor to please even the most discriminating palates. Enjoy the wine by itself or compliment with one of our additional amenities. A 4–piece assortment of carefully selected confections from our in-house patisserie. Fresh baked 4-inch chocolate or strawberry mousse filled cake with “Happy Anniversary” chocolate greeting (48-hour notice). Fresh baked 4-inch chocolate or strawberry mousse filled cakes with choice of the following greetings: Happy Birthday or Congratulations (48-hour notice). 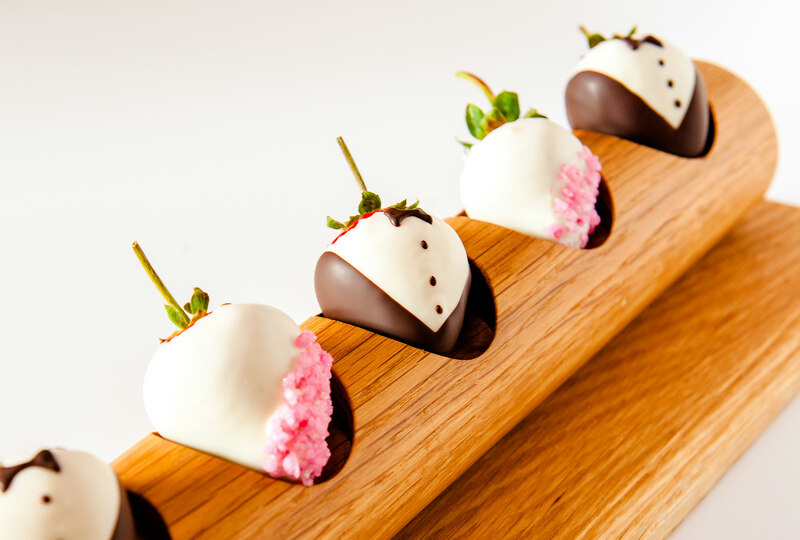 The Grand America signature amenity features a dark chocolate grand piano, garnished with some of our very own hand-made chocolates, seasonal berries and a fresh cut rose. A selection of three freshly-baked specialty cookies served with milk. A perfect way to say “good night”. Enjoy two crisp, refreshing bottles of either still or sparkling water, with fresh lime. Utah has its fair share of microbrews and your guest will enjoy a combination of two local beers paired with a generous serving of smoked almonds and wasabi peas. Enjoy a refreshing display of the season’s finest fruit and berries. In this popular fruit assortment, our freshest of seasonal fruits and berries are so delicately arranged that one may feel reluctant to upset this work of art. Local & International Cheeses including: Bleu, Triple Cream, Cow, Goat, Sheep’s Milk Fresh Berries, Dried Fruit, Fig Paste, Artisanal Breads, Water Crackers. Local & International Charcuterie Cured Meats including: Proscuitto, Mortadella, Sopressata, Salami. Local & International Cheeses including: Bleu, Triple Cream, Cow, Goat, Sheep’s Milk, Pickled Pearl Onions, Pepperoncini, Cornichons, Grain Mustard, Lavosh. Create new fond family memories while enjoying the classic games of Parcheesi, Tic Tac Toe, and Skip Rope from our JouJou toy boutique. This amenity offers fun for all ages. This crisp, refreshing, non-alcoholic treat may be enjoyed with or without the accompanying strawberries. Choose from a wide selection of red or white wines by the half bottle. Enjoy the wine by itself or compliment with one of our additional amenities. Help your guests start their stay off right with our twist on this classic cocktail. Guest will mix their own combination of Absolut Vodka and house-made Bloody Mary mix. We will supply an array of garnishes to include; olives, limes, celery and Tabasco.